This continues my discussion from last issue about ‘Non-Judgemental Intention’. Setting your Intention shapes your Journey; it is Your Way through Your Life. Realising the “Intention of Non-Interference” was again one of those lightbulb moments that opened up my personal Journey and became the main reason to me why self-development is so important… and why it underpins our wellbeing, our physical and mental health, and the importance of consciously working towards having a Life we love every day. 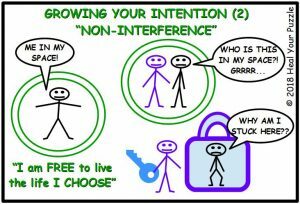 Non-Interference is considered not only a fundamental spiritual law but actually underpins all Human Rights. 10 Dec 1948, the Universal Declaration of Human Rights (UDHR)… for all peoples and all nations… to be universally protected, Article 1 states “All human beings are born free and equal in dignity and rights. They are endowed with reason and conscience and should act towards one another in a spirit of brotherhood.” Human Rights are the basis of International Law protecting free speech, freedom to live your life, physical and mental privacy, safety and security, the right to education, amongst much more. As much as we have protected Rights, do we all feel safe? Do we all live our lives freely? Without discrimination, intimidation, injustice, inequality… the idea of living in the “spirit of brotherhood” is still a work in progress! As much as humanity has become ‘civilised’, we are all individuals with unique energy fields with inherited traits and different experiences, our own unique choices put together in our minds in our own unique way… and then we have to relate to each other… how do we do this healthily?